Musical Fidelity has just release a new budget, no-frills, performance-focused digtial-to-analog convertor – their V90-DAC. The V90-DAC is small and compact to reduce costs on materials and shipping and put more of the cost into raising performance. 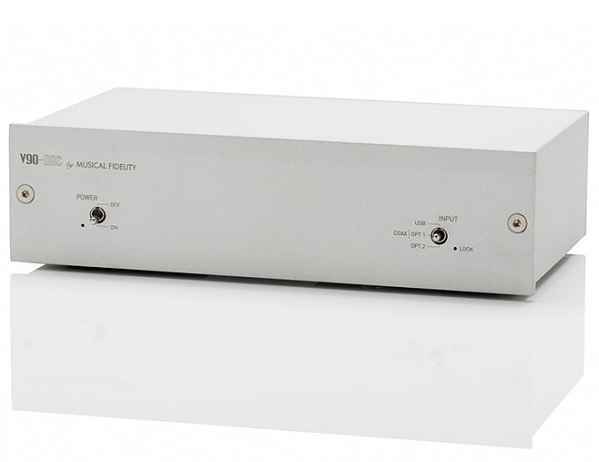 Muscial Fidelity claims that the componentry on the V90-DAC’s pcb is no different to the heart of any state-of-the-art DAC other than a greater focus being put on efficiency of space used for the internal components in the V90-DAC. – Distortion is 0.00025% at 1kHz and 0.0003% at 20kHz. The V90-DAC has beautiful looks and has excellent build quality. The front panel and cover are custom made fine line extrusions. The finish is crystal bead shot blast, fine texture moonstone. The overall fit and finish gives the impression of an expensive high-end product.